Woody is an interesting side-canyon of Woodruff Canyon, east of the Ticaboo Road south of North Wash. 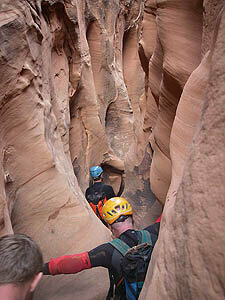 Unusual for the area, it features keeper potholes with fun problem-solving and downclimbing. It was 'discovered' for our group by Dave Pimental in the fall of 2007. It is really fun. The scale is human-friendly. A few cold swims make it stimulating, and there are quite a few stemming and down-climbing problems to keep you warm. Rappels - well, we used the rope for some of the pothole exits and entries, but did not need to leave anything in the canyon for anchors. Let's keep it that way. Bring pothole escape tools (ropes, tiblocs, etriers, Pot Shots) and keep your wits handy! Woody is an un-named fork of Woodruff Canyon, the second drainage on the south side, below the road. It runs northeast from Point 4897T on the Mount Holmes, UT Quad. A "woody" is a training device used by climbers to increase their hand, arm and contact strength. Please do not install bolts! Navigation, natural anchoring, downclimbing, pothold escapes. Water levels will affect the difficulty of the canyon. High water will reduce the effort needed to descend the canyon. Lower water will reveal two or more keeper potholes. Additionally, several small drops are encountered which require temporary sand-bag anchors. 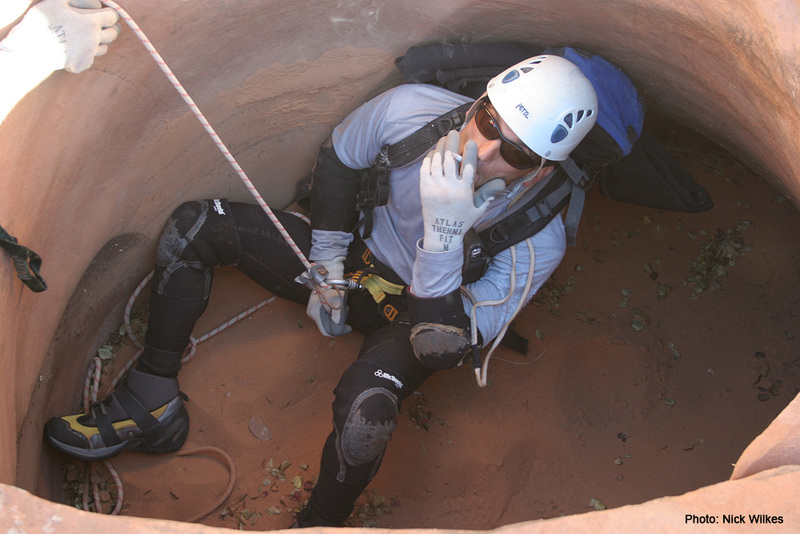 Do not proceed down canyon until you have determined how you will escape any keepers as well as how you will anchor or assist any small drops. From Highway 95 in North Wash, take the Ticaboo Road south 12 miles to where Woodruff Canyon crosses the road. Two major forks cross the road--the more northerly makes for a shorter approach. Park here, you will return hike to the car. Drop into the wash from the road, then hike down Woodruff Canyon for 1.6 miles. A spring on the left puts a little water (and a lot of vegetation) in the stream bottom. Continue down-wash 50 yards to where a cattle trail allows easy access up on the bank on your right. 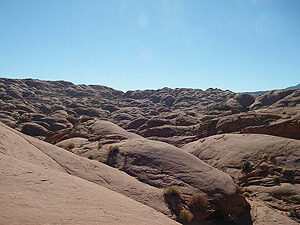 From the top of the bank, make your way to the most-likely looking fin of Navajo Sandstone, and ascend to the rim. Follow the fin to the top and zig-zag your way through the fins heading right (southwest) towards the slickrock domes now in view. A little route-finding is required to pass several chasms near the start, but soon find a moderate traverse-line that heads to the top of the canyon. The exact starting point makes little difference; basically, the higher you start, the more canyon you get! Make your way downcanyon. Narrows alternate with open wash, intensifying as you work your way down the canyon. There are many potholes, some of which require some thought to traverse. Creative sequencing, sandbag anchors, partner assists and packtosses will be needed to work your way through. Water levels will dictate the best method for each problem. A final small drop can be rappelled, though the last person can downclimb with spotting and support from below. 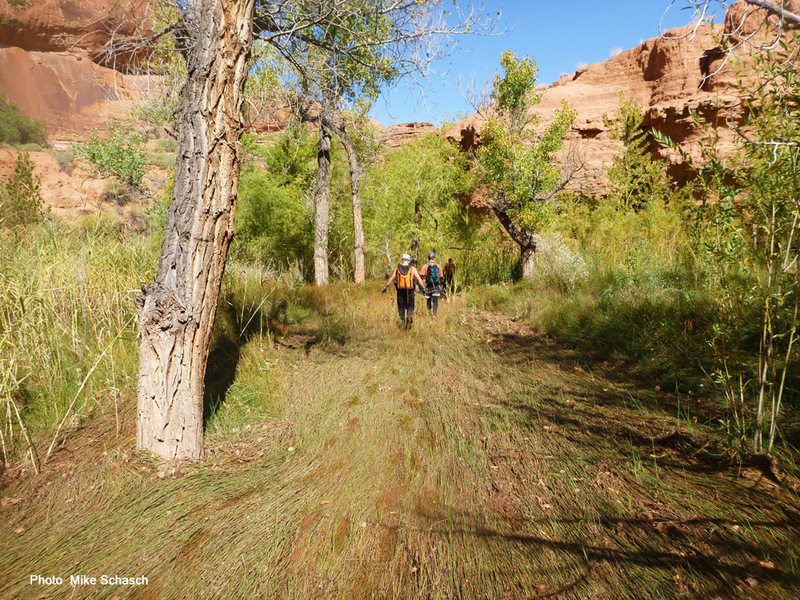 Hike out the high-walled box canyon to the main wash, then retrace your steps up-canyon to the highway.